I am totally blown out and amazed by all the emails that have been have been sent in by people who support the Free Farm Stand in the park and love what we are doing. I actually don’t know how to express my feelings when I have read so many stories of what the Free Farm Stand means to people, my heart is really touched by grace. I think this experience of having Park and Recreation wanting to move us out of the park has brought people together in a positive way and strengthened our community. More people have come out wanting to volunteer and to help us become more sustainable. An older Spanish speaking woman just came up to me at the Free Farm Stand and gave me a big hug! I am feeling very hopeful that this is all good and it has been for me a beautiful learning experience as well so far. As of today Park and Recreation hasn’t gotten back to me about having a meeting. A new development has arisen though. The San Francisco Health Department has gotten involved (they called me this morning) and I spoke with a very nice and supportive woman named Stephanie Cushing (Princial Environmental Health Inspector). There are state codes that the DPH follows regulating produce stands which are pretty much exempt from rule/regulations if they are on premises that are operated by a producer (in control of the premises (like if the park would let us be there or we set up the stand at the Free Farm which we control) and they sell or in our case give out only produce. Then if we don’t fit in the category of a produce stand we are bumped up into the classification of a farm stand. At farm stands “food preparation is prohibited with exception of food samples” (and there are regulations about that too) and we have to have a toilet and hand washing facilities available for our employees and operators. What I talked to Stephanie about is the idea of crop swaps. Remember the Chronicle article a couple of weeks back that we were listed in and I wrote about Crop Sharing? 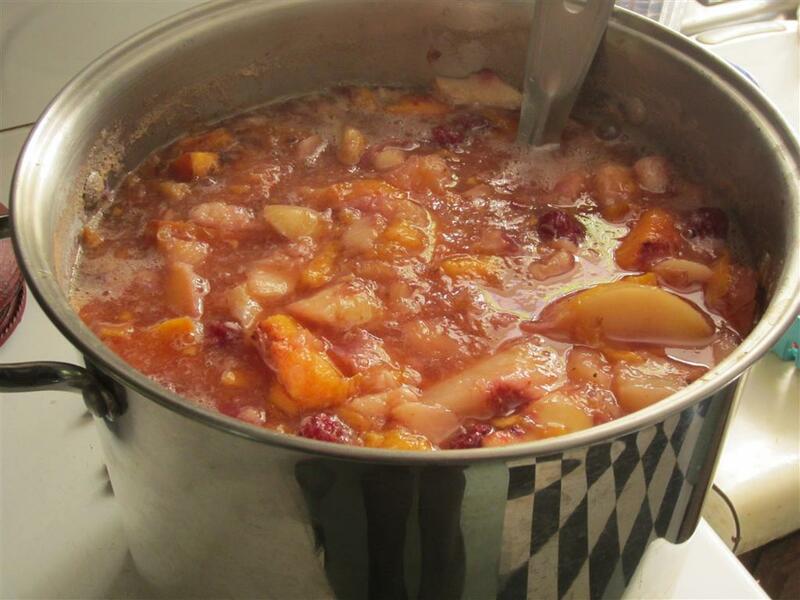 I am trying to promote the idea of neighbors getting together once a week and sharing their surplus produce or their “valued added” product like jams or pickles or pies. It would be like you go over to your neighbors and bring them a jar of some homemade hot sauce or honey you just got from your beehive and they whip out a loaf of organic day old Acme bread and put some on to taste it. 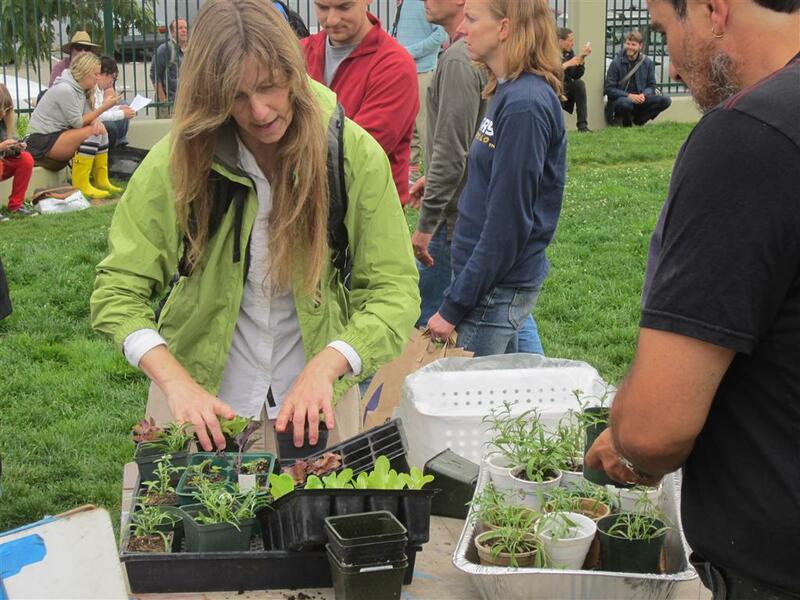 But instead of going over to your neighbors you would go to the neighborhood garden sharing activity in the park like the Free Farm Stand. There you would share the product you made with a other neighbors, especially those in need that are on tight budgets trying to get by without a job or on little income. So for the health department if you are “giving out” jam or hummus or selling it, you would need to cook or prepare the product in a code kitchen. The area is grey in my opinion if you are sharing it with neighbors in a public space. 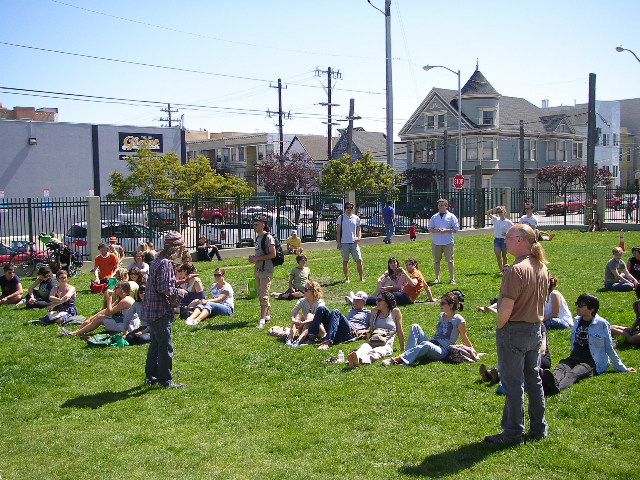 Is there a difference between sharing something with another neighbor in a public space or giving things away as a food program would do? So the DPH sees us a food giveaway program probably like Park and Recreation. It is an uphill battle! Since the beginning I have been trying to do something different, which is a difficult thing for most people to understand, because it is a subtle difference between giving away large amounts of produce vs sharing the surplus from a farmer’s market, or an apple tree, or from surplus from someone yard or farm. Though from all the emails I think a lot of people do sense that we are different and that the ”sharing” community we have created is real for them. We will have to convince them that Acme is sharing their surplus breads with their neighbors (also some people say the corporations are people) and that sharing our homemade jams and pickles is what is happening. Though staying in the park is our first important goal to work towards and these other details can be worked out. Yesterday started out foggy and cool, but most people were happy that it wasn’t as hot as the week before. I would say things went smoother than last week, partly because of less people (167 approximately) and because we are working the kinks out of our system of handing out numbers. It is apple season and we had apples from a few source. Produce to the People gave us over 89 pounds of apples from a tree in Bernal Heights, Bilkis brought apples and pears from Marin, a new friend brought apples and pears from her orchard in Santa Cruz. 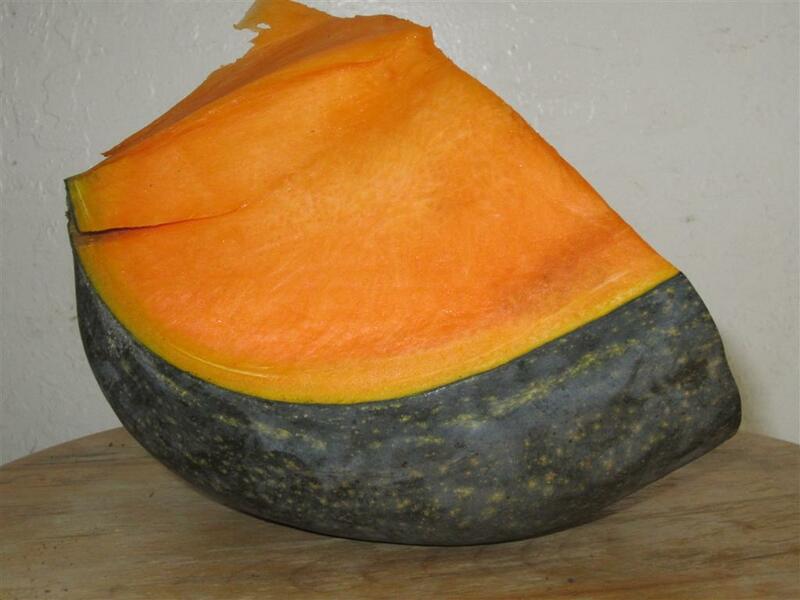 Again I brought over two large heirloom squash that were donated from the Heirloom Expo a couple of weeks ago. On Saturday morning Claire and I harvested 10 pounds of cherry tomatoes and hops from Esperanza Garden in the Mission. That garden unfortunately needs attention as I think there are not enough people taking care of it on a regular basis. Another garden that needs help is the Secret Garden. 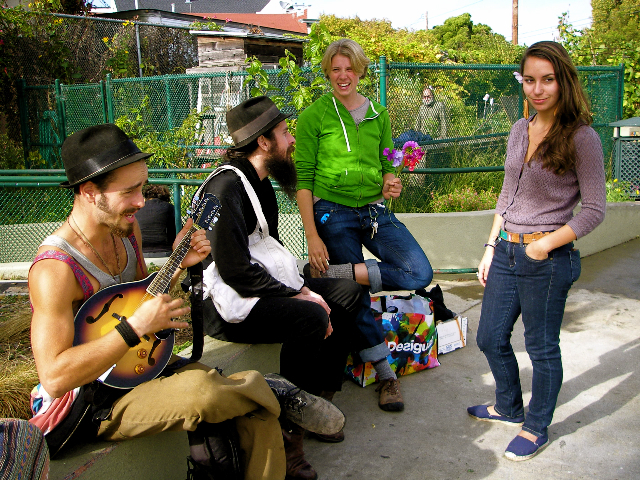 On Saturday I walked by the People’s Tenderloin Garden on McAllister and Larkin St.(http://www.tndc.org/community/garden.html). A very sweet man named Lorenzo who helps run that farm visited our farm last week and told me how it runs. 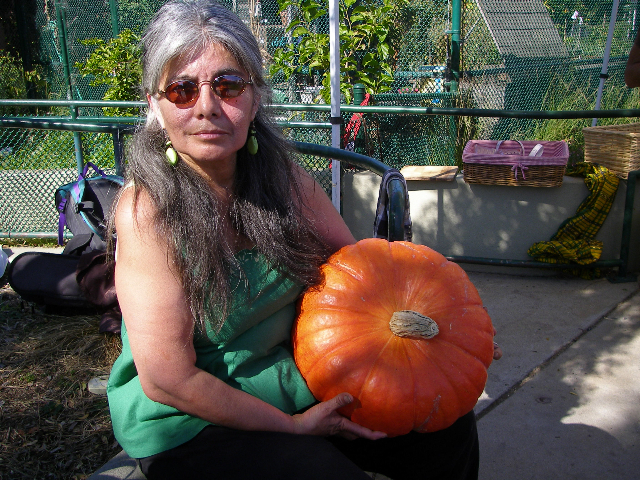 It has common beds and twice a month they harvest and the produce is shared with mostly the people who grew it who are nearby nearby residents and actually anyone who show up on harvest day. How cool is that! The July harvest they had 500lbs! They weigh their harvest like us! I was impressed with their row of very happy eggplant. Yesterday it was a very chaotic day as we began giving out numbers to people so they wouldn’t have to wait in a long line and could instead hang out in the park, sit on the grass, or take off for a while. At the end of the day we gave out 216 numbers and it took from 1 until about 3pm or so. It was a very hot day and the park has few trees to sit under to get out of the sun, so a number of people waited in line because there was shade there in the spot where people used to line up. I heard from a number of people that people liked this new system better and it seemed to make things go smoother. I think things should get better as we work the kinks out of the way we hand out and call numbers. 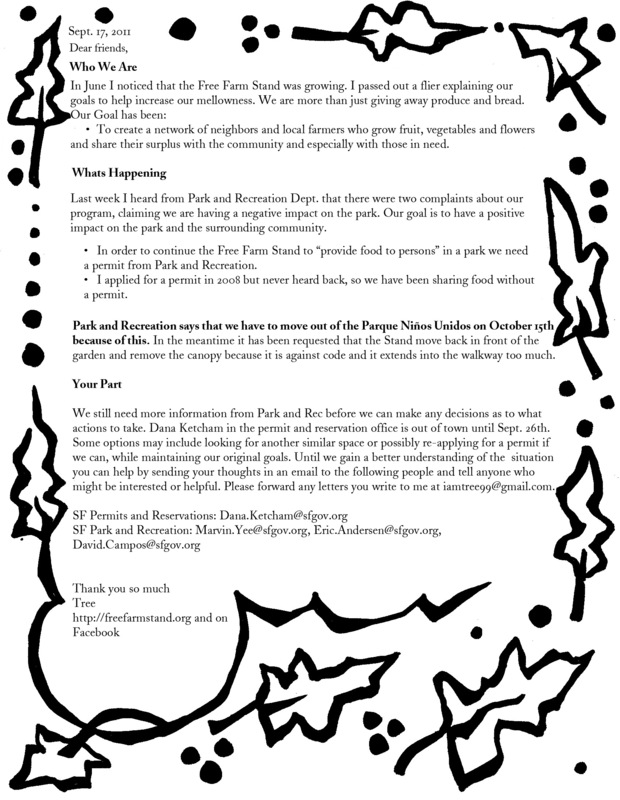 There are a number of factors that may be contributing to this situation and why that Park and Rec is focusing on us now after three years of happily sharing food in the park. One is that we have grown in size and that does have an impact on the park. I noticed yesterday that handing out the numbers basically got rid of the long line down the street, but still people had to wait a long time to get produce and most of those people hung out on the grass. I would like to have a canopy for people to sit under, but supposedly canopies are considered a structure and that is a no no in a park I am told. Also, I was told that both Dolores Park and Mission Playground on 19th st. are under renovation and both those have kid playgrounds that are under construction and closed at the moment. That might mean more parents coming to our park and maybe some disgruntled parent complained when they saw what we were doing. I have various emotions about this situation. I think it would be sad to stop doing the Free Farm Stand in this park. At the same time I have to be honest that it is a lot of work to make the stand happen each week and I haven’t been able to find the consistent help behind the scenes that is needed to bring the stand to the park every week…that includes picking up the produce, sorting it and packaging it so it is easier to move, dealing with the surplus soft fruit and vegetable,’and cleaning up afterwards, including putting things away at my home, and doing this every weekend. So sometimes I get tired and feel like I need more help. In the meantime I am doing some discernment and also looking at all the options, and hopefully will talk to Dana Ketcham in the permit office when she returns. I really believe that change is part of living and that sometimes unexpected good comes out of difficult bummers. One highlight of my week was going to the heirloom expo in Santa Rosa. 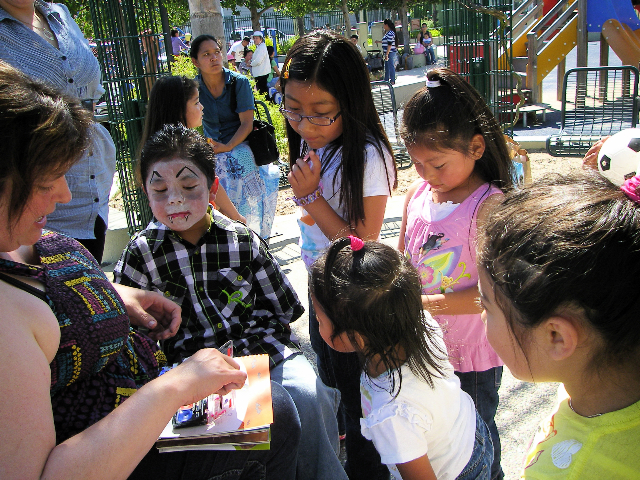 It was an overwhelming experience seeing all the diversity in vegetables and animals that were on display there. Though it did make me feel a little uneasy seeing all the beautiful chickens and turkeys, cows, and sheep, in small pens being stared at by people like myself like they were in a zoo. I doubt the pumpkins and squash didn’t mind showing off their stuff. I especially liked the California Rare Fruit Growers display of 60 types of apples and I don’t know how many kinds of pears were there, each with their own label and the pears with some history typed up. The show really made me come away thinking that God/Goddess or life force is such a crazy creative energy with an infinite pallet to paint with. Through my friend Justin I met his friend Aaron who among other things saves seeds and breeds vegetables. His display of his giant beets and carrots was really fantastic and trippy, and Aaron said they all are quite edible and not woody or tough. 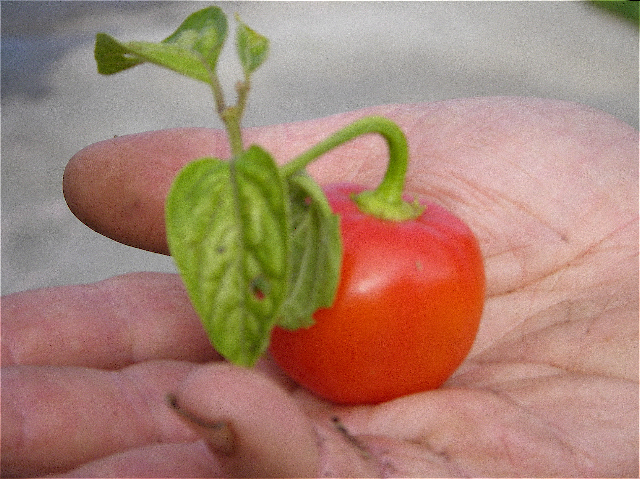 I also came away being inspired to grow less hybrid vegetables and grow more open-pollinated plants that one can save seed for (you can’t save seed for hybrids). 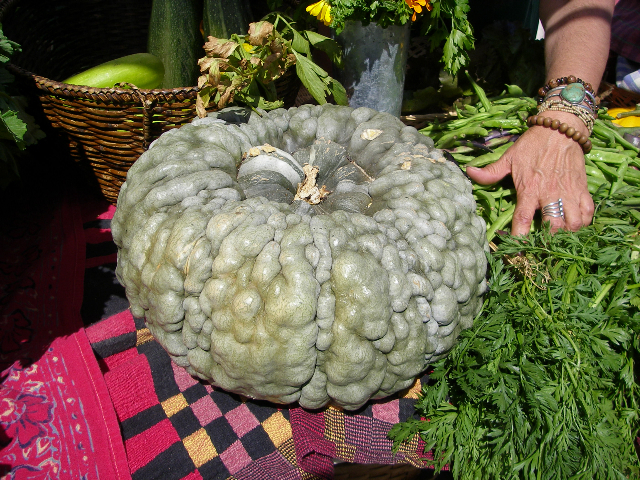 I met a woman who was running the Napa County Master Gardenr’s booth that has a display of the most beautiful heirloom squash and sh offered to give them to me for our Free Food Stand after the show was over. 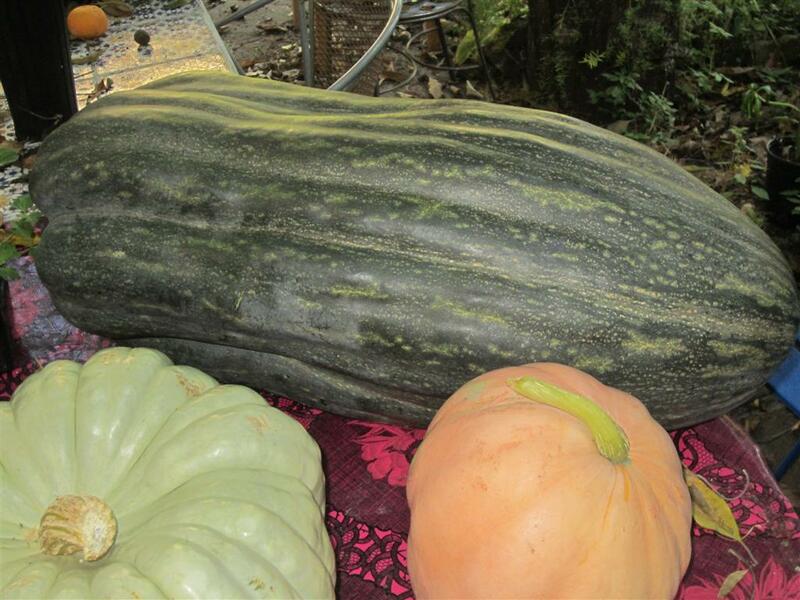 So I took home quite a display of winter squash and I brought two for the Stand yesterday. It took some time to cut them open, but they look quite yummy inside. 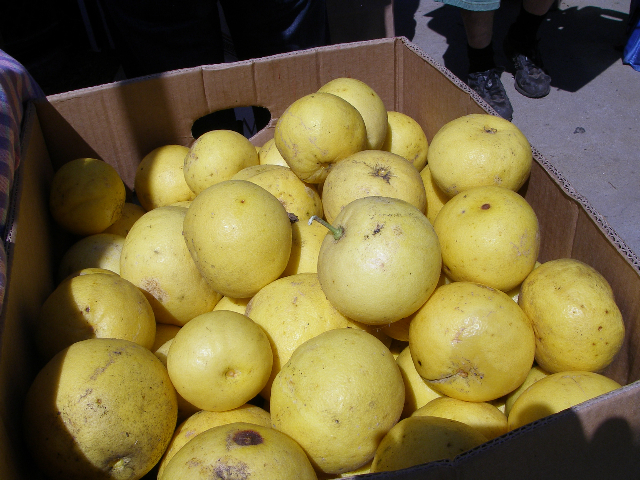 A friend who lives nearby on Treat Ave, came by with 98 pounds of grapefruit from his backyard tree. We had a huge amount of produce as usual including a giant harvest of green beans from the Free Farm, 26 pounds. Of course, we also got hundreds of pounds of green beans left over from the farmer’s market.